TuneIn is an all-around great app with plenty of features like personalized music, podcasts, sports, NFL radio and much more. But all of these amazing features do come with a hefty price of $9.99 per month. Moreover, TuneIn can annoy some users with its persistent notifications and native in-app ads. While this may not drive you away from the app but it’s always good to have better alternatives. Here are some of the best TuneIn alternatives for you. Let’s check them out. Some smartphones has an FM radio built right into it which you can use to stream local radio stations. To find out if your smartphone has built in FM, simply search for FM or Radio app in the app drawer. Streaming apps are the best alternatives to the TuneIn app if all you want is listen to music. Although you won’t get every radio station on these apps. Pandora has a number of radio stations and like your music preference changes over time, it suggests newer radio stations tailored to your taste. 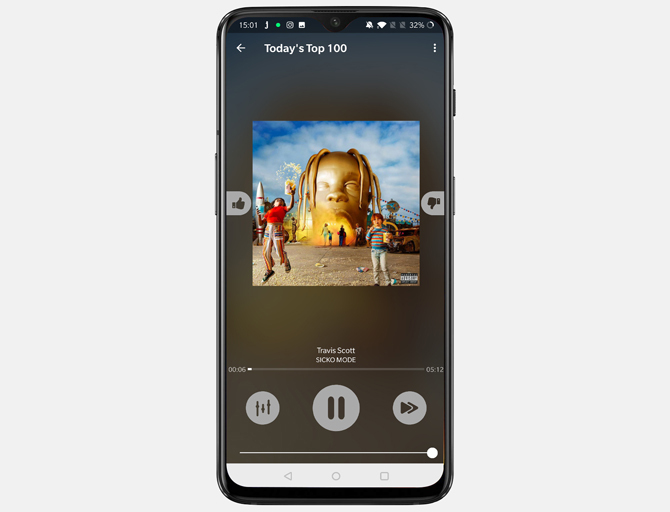 Overall, the music streaming apps offer plenty of features and if you already have a subscription to any one of Google Play, Pandora, Apple Music, or Spotify you can get almost all the features of the TuneIn app. Jango is a simple internet radio app which offers curated music radio stations. You can explore categories and genres of music to fit your musical preferences and start listening to the radio stations. Jango has 25 different genres and each genre holds around 30 stations on average, which means you get more than 600 stations on this app. Jango would be a perfect TuneIn alternative as you can create your custom radio station by searching for your favorite artists. It also streams high-quality streams just like TuneIn. Plus there is no limit on the number on skips. You can also filter out the songs from your streams, If the app plays a song that doesn’t fit your preference, you can simply tap the dislike button to remove it from the stations. Although the app has ads, it only appears in the music player and does not interrupt your music experience. There is, however, one problem with the playback, the stream plays at a slightly higher speed than normal. It’s so subtle I didn’t notice it until I tried to sing along. It’s still something worth mentioning. Jango is free on Play Store and contains ads. While Radio Garden is not exactly a TuneIn Radio replacement, it’s there in the list because of its unique interface. When you open the Radio Garden app, it shows 3D earth with little green dots scattered around the globe. To play a radio station, scroll the earth and locate a radio station from anywhere in the world. As soon as the crosshair pinpoints a green dot it starts playing the local radio. Although TuneIn is a music app with many amazing features, it, unfortunately, doesn’t have an option to play local radio from around the world. Navigation on Radio Garden is rather easy, and you can pinch to zoom in and out, swipe to navigate. If there are multiple radio stations in the area, you can choose the next station from the bottom right. You can favorite a station for easy streaming and access it instantly. Radio Garden is always adding radio stations to its catalog and it just shows non-intrusive ads while you stream local radios around the world. Plus, the app takes you to a random station when you shake your phone which is a nice easter egg. Radio Garden is free on the Play Store. RadioDroid is an interesting radio app with some cool features. First, it’s free and open source app. You get a list of stations from across the world and you can browse by country, language, tags, top voted and top clicked. Second, you can record the radio streams on the app just like the old days when we used to record local radio stations on feature phones which by the way TuneIn doesn’t allow you to do. Third, just like TuneIn, you can set a Sleep Timer in Radio Droid. I like listening to the radio and fall asleep during and this feature comes in handy when you don’t want to waste your mobile data. And finally, you can also set an alarm which wakes you up with your favorite radio station. RadioDroid is a free and open source app and does not have any ads, while TuneIn locks in features behind a paywall and has ads. You can get it on F-Droid. Audials is an internet radio app which along with local and internet radio stations offers podcasts. It constantly analyzes your radio preferences and curates a list of station matching your taste. You can browse traditional genres as well. It comes with an inbuilt car mode which changes the interface to a minimalistic layout which ensures you don’t have to take your eyes off the road for too long. Audials support PC version and you can stream music from your computer after creating an account and syncing both devices. One very interesting feature of this app is Zapping, you can select an artist, choose a genre, and press zap now button to get a quick search across the radio stations. It finds all the matching radio stations playing music to your preference. You can schedule recording of a program which airs at odd hours without a hiccup on Audials. Audials also supports Chromecast and Airplay which means you can stream your radio stations to your TV. It works flawlessly and Audials is the only Android app that streams on AirPlay. Considering the number of features you get on this app, its a good alternative to TuneIn if you want a tailored radio experience. Audials is a free app and does not show any ads. However, there is a pro version as well for the app with more features. Xiia Live is another great TuneIn alternative with a huge internet radio directory. It claims of hosting more than 50,000 live radio stations (TuneIn has over 100,000) from across the world. The directory is powered by UberStations, another popular internet radio service. 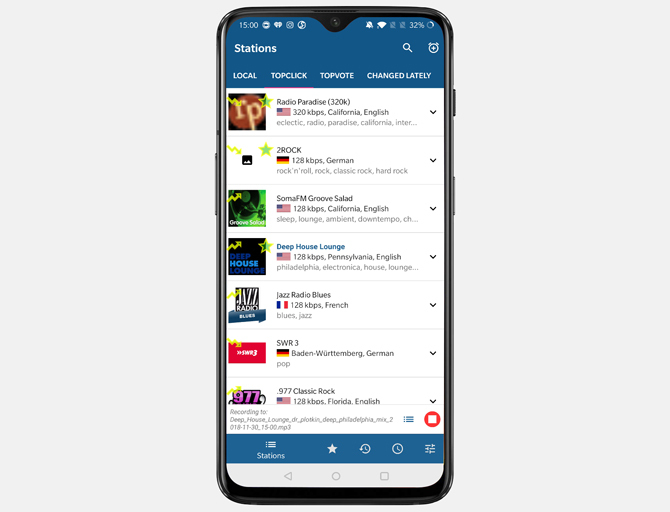 If you don’t find your favorite stations in the app, you can simply change the directory to SHOUTcast and you would get entire SHOUTcast directory to stream. It also has a Radio Reference directory which has all the Public safety audio streams(Police, Fire, EMS, and aircraft communications) from across the world. You can install this plugin for $2 from the Play Store. You can scrobble your music to Last.fm automatically. 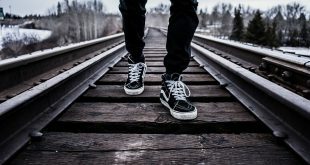 For those who don’t use Last.FM, Scrobble is a Last.FM API which scrapes your music preferences from other apps and curates a list of music tailored specifically to your taste. It’s a great TuneIn alternative. You should check it out, its great. Xiia Live is free and only shows banner ads on the bottom, you can remove the ads completely from the app by purchasing the pro version of the app for $3.99. 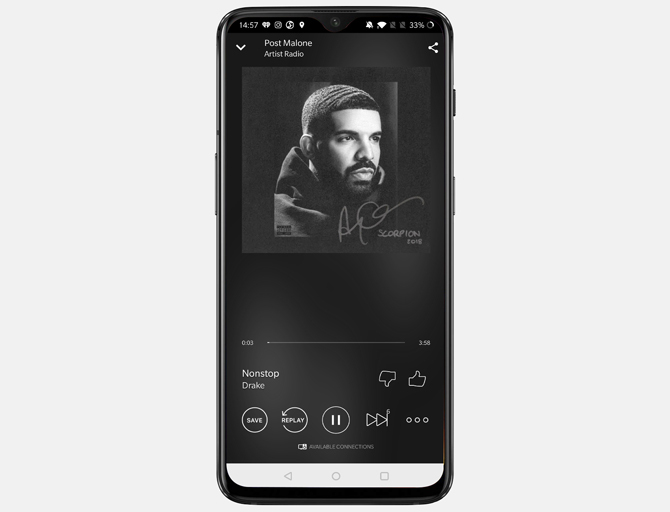 Slacker is a multi-platform music and radio service which allows you to stream music from your phone, and computer. You can browse popular stations based on genre and unlike TuneIn, you can create your own custom station by liking your favorite songs and artists. The list is automatically created when you start liking songs on the app. It needs at least one liked song to curate a personalized list for you which is great. Also, you can cast directly with a tap on this app. It shows Specials, a curated music stream released weekly and monthly. It is a stream of the hottest singles on the chart in each genre and this feature is exclusive to Slacker Radio. Slacker also offers Offline music which is patented according to Slacker’s product page. 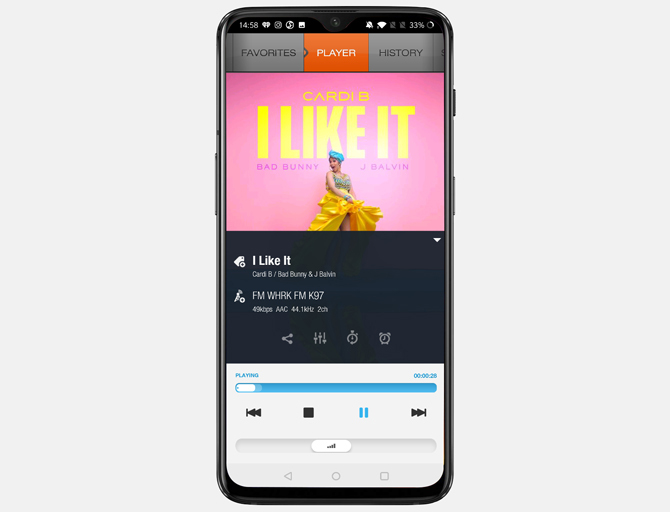 They claim with this feature, you can save playlists and stations on your phone and listen to it later on. 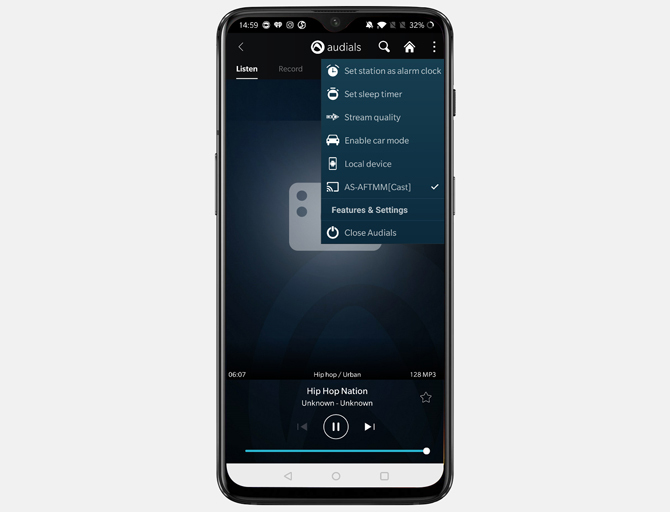 Considering Slacker has its own special events among other features like one tap casting to TV and intelligent music pattern recognition algorithm, you should definitely check out this TuneIn alternative. Slacker shows ads with its own audio ads but you can upgrade to the Plus version for just $3.99/mo. You get no ads, you can skip unlimited times, and you get highest quality audio. 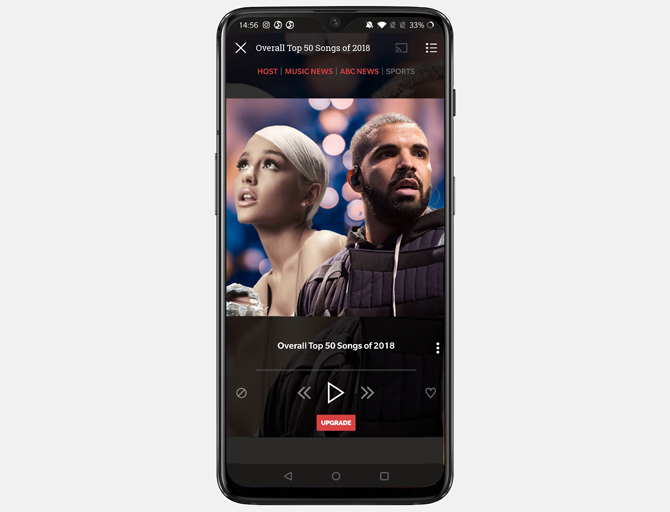 The more expensive premium version offers unlimited songs on demand, custom playlists, and you can listen to stations and playlists offline for $9.99/mo. iHeartRadio is the closest competitor to TuneIn with almost similar design layout and features. The app is built beautifully and the player has a cleaner interface. Based on your genres and music preferences, the app suggests music that would suit you. iHeartRadio takes your location and suggests popular radio stations near you including the most popular radio stations on the platform. 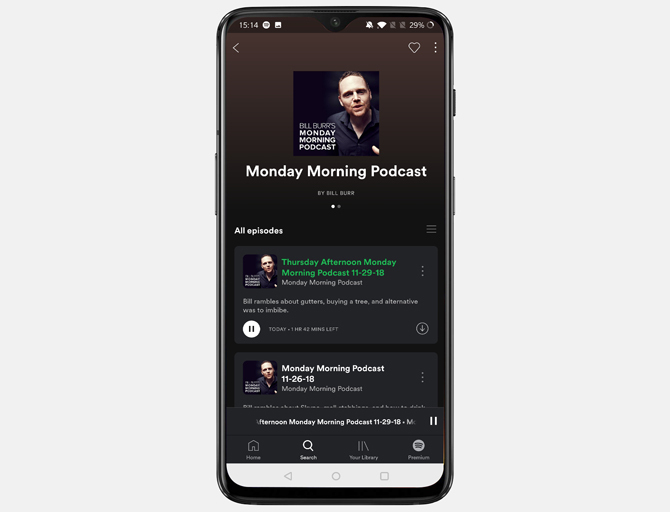 The app has a dedicated section for podcasts and includes all the popular podcasts like The Joe Rogan Experience, The Breakfast Club, TED Radio Hour, etc. You can listen to sports stations and audio commentary just as we did with TuneIn. The basic app is free and you can use it with ads, however, you would have to take a subscription of $5/mo to access all the paid features of the app. You get unlimited skips, replay, save songs, and create unlimited playlists with the monthly subscription. If you’re in the U.S you can take a 30-day free trial before purchasing the subscription. Which are the best TuneIn Alternatives? Each of the listed apps offers something unique, for example, Audials give you a dedicated car mode and one tap casting and Airplay options. Radio Garden broadcasts local radio stations from all around the globe presented on the map. RadioDroid is an open-source app which lets you set an alarm and time on the radio stations. Xiia Live integrates with Last.fm and scrobbles your music to Last.fm. Tell us which app do you like the most. Comments below. 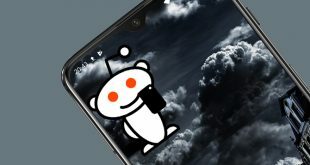 Previous Disable “Download our app” Popups on Reddit Mobile View?